23-year-old Adam Wachs chose to leave behind the good life in Philadelphia and move to Israel. His father: "We couldn't be more proud." 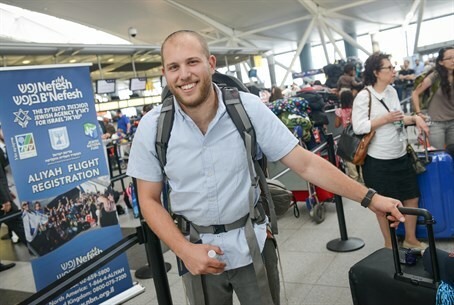 Arutz Sheva continues its series of interviews with some of the 221 olim who arrived in Israel on a Nefesh B’Nefesh flight this week. This time we speak to Adam Wachs from Philadelphia who was on the flight. Wachs, 23, recently graduated from the Wharton School at the University of Pennsylvania and, now that he is an Israeli citizen, he plans to serve in the IDF. Before the flight, Arutz Sheva caught up with Wachs’ parents, Michael and Lisa, who described the moment of seeing their son leave for Israel as “bittersweet”. “I plan on joining the army in November, and until then I hope to be working part-time in Tel Aviv and studying at yeshiva when I’m not working,” he said.